“…the integration of business processes from end users through original suppliers that provides products, services and information that add value to customers and stakeholders” (Lambert & Cooper, 2000: 66). “organizations will seek to buffer environmental influences surrounding their technical cores with input and output components. To maximize productivity of a manufacturing technology, the technical core ‘2’ must be able to operate as if the market will absorb the single kind of output at a continuous rate, and as if inputs flowed continuously, at a steady rate and with specified quality. Conceivably, both sets of conditions could occur; realistically they do not. But organizations reveal a variety of devices for approximating these ‘as if’ assumptions, with input and output components meeting fluctuating environments and converting them into steady conditions for the technical core.” (Thompson 1967: 20). “…the methods of competitively organising that come closest to the concept of supply chain management”. “…asset specificity (especially) and information impactedness, opportunism and bounded rationality, uncertainty and small numbers bargaining, together with frequency” (Williamson, 1983). “…to shield the firm, to the maximum extent legally possible, from competitive forces” (Teece 1984: 4). In the SCM literature, uncertainty is dealt with in different ways. At the core of logistics is the imperative that all supply chain processes (from raw material to the customer) should add value to the product. If added resources do not contribute to enhance the end product’s value, it is waste, and should be eliminated. In a “one sold, one made” perspective, inventories are the most obvious case of waste. When embedded in an uncertain environment, uncertainty will propagate through the entire supply chain system and complicate SCM (Davis, 1993). Uncertainties, occurring between stages in the chain, are most often assured against by using inventories, i.e. “protection against life in an uncertain world” (ibid., p. 38), or providing excess capacity (van der Vorst et al., 1998). Buffers, in time, capacity or inventory—to cope with uncertainty—lead to inefficient processing and non-value activities (van der Vorst & Beulens, 2002). One of the most influential approaches to uncertainty in the SCM literature comes from Fisher (1997). In his framework, the product type is crucial for the choice of supply chain, and the variation in level of uncertainty surrounding the demand for the product yields different supply chain design. He distinguishes between “functional” and “innovative” products: By “functional”, Fisher means products that satisfy basic needs, have long life cycles and enjoy a stable, predictable demand, while “innovative” products have short life cycles, exhibit great product variety, and meet unstable, unpredictable demand in their markets. According to Fisher, supply chains should focus on efficiency to minimize the costs of functional products. For innovative products, supply chains should be designed for responsiveness to avoid expensive market mismatches. Fisher’s emphasis on market respons¬iveness and physical efficiency is similar to Christopher’s (2000) distinction between the leanness and agility: where leanness suits high volumes, homogenous products with predictable demand like commodities, agility suits low volumes, differentiated products with high demand variability. Stable demand allows for a focus on efficiency and low cost. Volatility in demand for innovative products entails a greater risk on the part of producers in terms of shortage or excess supply. This risk is escalated by shorter product life cycles, which favour a market-responsive supply chain. “A ‘stable’ supply process is one where the manufacturing process and the underlying technology are mature and the supply base is well established. An ‘evolving’ supply process is where the manufacturing process and the underlying technology are still under early development and are rapidly changing, and as a result the supply base may be limited in both size and experience.” (p. 107). Mason-Jones et al. (2000) combine leanness and agility in the same supply chain, as an equivalent, yet opposite, approach. In their hybrid strategy, “leanness” is retained upstream of a determined decoupling point ‘4’ , while processes downstream of this point focus on flexibility (agility). This strategy is in their view better able to ensure best practice SCM when early supply chain stages are relatively stable, while end-markets are calling for increased attention. This section describes how we examine our research question empirically, i.e. to which degree supply chains in our industry subscribe to SCM practices, and if they reap the prescribed benefits therefrom. The industry consists of approx. 500 companies in 11 different industry segments — defined by the main products they bring to the market. We focus on two distinct supply chains, the stock¬fish segment and the whitefish fillet segment. Common to both supply chains are substantial uncertainty related to input supply. The two different supply chains was chose for this study because they cope with supply uncertainty in different ways. Thus, we obtain variation on how these chains are managed at the same time as undesired variations in industry conditions is kept at a minimum. In this way, “industry effects” caused by cross-industry differences are unlikely to influence the results. “…transactions follow a repetitive pattern, with both exporters and importers having their regular trading partners” (Dulsrud & Grønhaug, 2007: 11). Fish product supply chains are characterized as push, rather than pull, systems. Traditionally, the Norwegian fisheries industry is characterized as volume-oriented, where target figures are related to production yields, batch sizes, and inventories rather than balancing production with consumer demands. The development in food supply chains in recent decades has been one where power has shifted from manufacturers to groups of retailers. This has, in turn, rendered food products as “…functional products with volatile and unpredictable demand”, as “retailers set the prices and demand frequent and responsive deliveries on short notice” (van der Vorst et al., 2001: 74). In our analysis, the total supply chain is taken into account, but the emphasis is placed on the supply side — an environment shared by almost all aspects of the Norwegian fish processing industry. This is also the business area that deserves the most attention from managers in this industry (Ottesen & Grønhaug, 2002; 2003), where purchasing is not only an integral part of running the company (Gadde & Håkansson, 2001) but one of the most important ones. The fish is caught outside Lofoten, mainly with size-selective gears (e.g. gillnets), in March. The fish is normally stored onboard no longer than 6–10 hours before it is landed (headed and gutted) to processors. There, the fish is rinsed, the fish is tied together in pairs by the tails, and then hung on drying racks, where it is left to dry from early March until mid-June, when it is taken inside for subsequent drying. From August, professional graders sort the fish into 17 different qualities, before it is pressed together in batches of 25–50 kilos and sewn into gunnysacks, ready for export. Most of the production is sold during the autumn. Some is also sold in the spring, but the end-product can be stored for up to a year. When exporting the stockfish, most producers use agents as middlemen, but some export on their own and represent themselves in meetings with importers ‘7’. Stockfish is a very expensive product and possible deterioration is often not discovered until the product reaches the “soaker”. There, the fish is soaked in water for approx. 10 days, until it reaches about the same weight as before drying. After this, it is sent to retailers or restaurants. Italy is actually comprised of five different regional markets, with regional variations in how stockfish is preferred and prepared. In summary, processing companies in both supply chains use multiple sourcing. However, as both supply chains are push-oriented, the choice of suppliers is not restricted to price, quality and supplier service criteria. Processing firms are said to prefer volume over quality when “selecting” suppliers, in order to reduce transaction costs due to a substantial overcapacity in the industry and floor prices set by the Fishermen’s Sales Organization. In most cases, however, it is the supplier who chooses whom to sell to, and not vice versa. Landing place choices are based on the prices and the service offered by the buyer, and mobility restrictions of the vessel and the condition of the catch (preservation issues) are also taken into account. In addition, we need to translate the “wise words” of SCM into activities and practices observed in the supply chains in question. We do so by following Storey et al.’s (2006) “ideals”. In Table 2, each SCM “ideal” is listed (see Table 1), with scores for the two supply chains (stockfish and whitefish fillets, respectively). The scores are based on our experience-based knowledge of each chain for each “ideal”. An inspection of Table 2 reveals how the stockfish and whitefish fillet supply chains score against the ideally managed supply chain, noted earlier. 6 “Batch to sale” configuration of products and production is much higher in the whitefish filleting companies than the stockfish companies. The 400-gram fillet box found in supermarkets is identical to what is sent out from the filleting company. When purchasing stockfish in Italy for home cooking, it is rarely found in supermarkets and, if it is, it is hardly ever displayed on a shelf together with other staple products. Consequently, while product design and packing is essential for filleting companies, it is almost absent in the stockfish chain. Additionally, in order to ensure pipeline efficiency, a seamless flow is preferably supported by a batch-to-sale configuration of goods, information sharing and collaboration among supply chain participants. If the flow of goods throughout the chain is coupled with state-of-the-art information systems “…the transportation system becomes the warehouse” (Tan et al., 1998: 4), and “seamlessness” is more easily attained. From our presentation of the supply chains, it is obvious that the flow of goods to the market from the whitefish fillet chain is closer to fulfilling these ideal SCM requirements than that from the stockfish supply chain. The average company size in the whitefish filleting chain further contributes to fulfilling the ideal SCM requirements, and the fact that several of them belong to one manufacturing concern, eases an overall supply chain strategy and the use of tools to enable better information, coordination, control and organization throughout the supply chain (Cigolini et al., 2004). Company size also ensures an ability to successfully implement complex logistical tools within the whitefish-filleting segment (like JIT, TQM and R&D-efforts with respect to optimal packaging and batch configuration), which, for small companies in the stockfish branch, might be deemed superfluous or redundant utilization of managerial resources (Arend & Wisner, 2005; Bates & Slack, 1998). All in all, inspection of Table 2 reveals that the whitefish filleting branch is the one most in accordance with concurrent SCM principles – however, not a ‘perfect match’. Our mapping shows that the whitefish filleting supply chain corresponds better with the “ideal” SCM characteristics in items 1 to 7 in Table 2, than does the stockfish chain. One reason might be the atypical industrialization process this segment has undergone, partly due to its political legitimacy, where the utilization of modern technology has been central. Also, of the two supply chains addressed here, whitefish filleting has suffered the most from increased competitive pressure in recent decades. Average profitability in the fishing industry (i.e. the fishing fleet) has exceeded that of the fish processing industry since 1996. This is not surprising, as fishing involves the harvesting of a renewable resource, which, if managed properly, should achieve economic rent. Parallel to the multiple sourcing of fish processing companies, fishing vessels have multiple buyers for their catch, depending on price, species caught, catch area and season. Hence, the supplier base of a processing company can consist of numerous vessels, just as the circle of customers. It is natural to measure supply chain profitability at the processing stage, as this is where the main transformation process takes place, “sandwiched” as it is between suppliers and customers. We demonstrated above that the organization of the stockfish supply chain is inferior to that of whitefish filleting, as measured against the “ideals” from SCM. Here, we find the supply chain best in accordance with SCM principles also to perform the worst. Below, we shed some light on the paradox of SCM principle adherence and the lack of profitability effects therefrom. Our results shows that prevailing SCM principles are more commonly implemented in the whitefish filleting supply chain than in the stockfish chain. 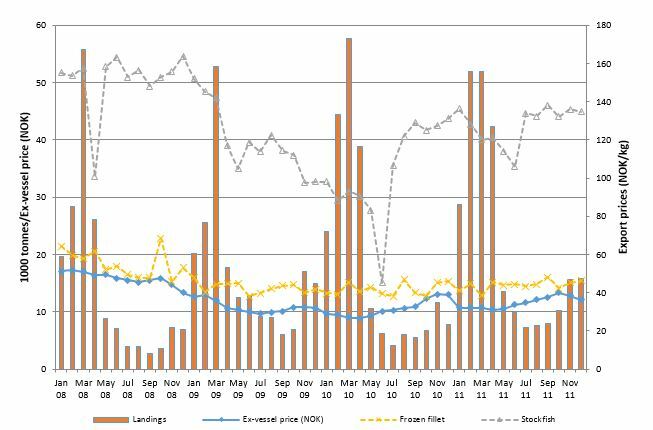 Contradictory to literature prescriptions, our findings indicate that the stockfish supply chain displays greater long-term financial performance (i.e. competitive advantage) than the whitefish filleting supply chain, despite the fact that it to a much lesser degree conforms with prescriptions of “ideal” SCM. To our knowledge, the only SCM research undertaken in a similar setting, is Hameri & Pálsson’s (2003) study from the Icelandic fisheries industry ‘9’ . They take a wider approach, where they map the situation of the Icelandic seafood supply chain and point to its single largest challenge, which is to absorb raw material flow variations upstream, as — after all — the demand for fresh, salted and frozen fish is relatively stable. Product characteristics and consumer demand also shed light on performance differences. Globalization, competitive pressure and market fragmentation have affected whitefish filleting companies much more severely than the stockfish supply chain. 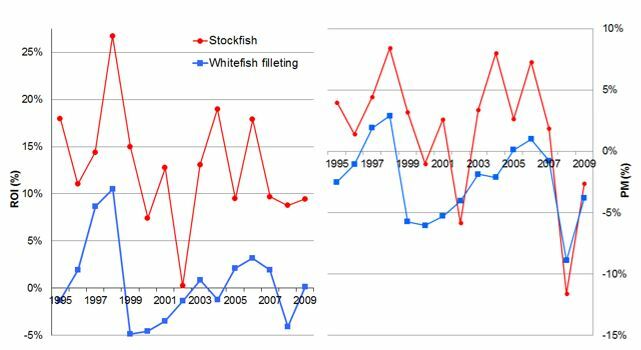 With its commodity-like product exposed to competition from other species and from other nations, the whitefish filleting branch is ‘stuck in the middle’ with falling margins, due to increased competitive pressure in both input and output markets. Onboard freezing and subsequent warehousing opened up the raw material market, which eroded localization advantages. Due to this, Norwegian whitefish fillet producers found themselves in competition with Chinese companies ’10’ , producing the “same” product at lower labour costs, but also with less valuable species like Alaska pollock, hake, pangasius, tilapia and blue whiting. Structural changes in the supply chain, with increased bargaining leverage at the retailer stage, have also altered the business landscape considerably. The dynamic and rapid changes in the competitive environment led to eroding advantages for whitefish fillet processors (Bendiksen & Dreyer, 2003; Sogn-Grundvåg et al., 2007). Even though conditions were in place for near ideal SCM in this segment, the possibilities for profitability levels above average became limited as time passed. Supply side conditions are the largest obstacle to implementation of effective SCM practices in our setting, but in literature, this side of the coin is often neglected as a problem for the supply chain. For instance, Mason-Jones & Towill (2000: 45) ascertain that “… the supply side and manufacturing process segments are essentially under the direct control of the business and may be tackled using principles such as lean thinking”. Furthermore, Childerhouse & Towill (2004: 586) assert that “… supplier interface uncertainty results from non-compliance with our orders”. In the fish processing industry, this is clearly not the case. Orders for fish are only exceptionally placed, and the supplier interface is either near faceless, as in the case with frozen fish or pelagic fish auctions, or highly relational, as in the traditional long-term relationship between colocalized vessel owners and processors. “…customers’ needs, while always important, are subordinated to the decisions and needs of the supply source” (p. 219). For policy makers, any step to improve information sharing in the chain, enabling the potential for traceability and, thus, increased customer satisfaction, would support the chain’s competitive power and improve SCM. Further, to keep and protect Norwegian seafood producers’ competitiveness on the global marketplace it is essential that authorities manage waters and fish stocks in a sustainable manner, so that products can be marketed as healthy, and “originating from cold, clear Norwegian waters”. Dyer, J.H., D.S. Cho & W. Chu (1998). Strategic supplier segmentation: The next “best practice” in supply chain management. California Management Review, 40:2, pp. 57–77. Mason-Jones, R. & D.R. Towill (2000). Coping with uncertainty: Reducing “bullwhip” behaviour in global supply chains. Supply Chain Forum: An International Journal, 1:1, pp. 40–45.